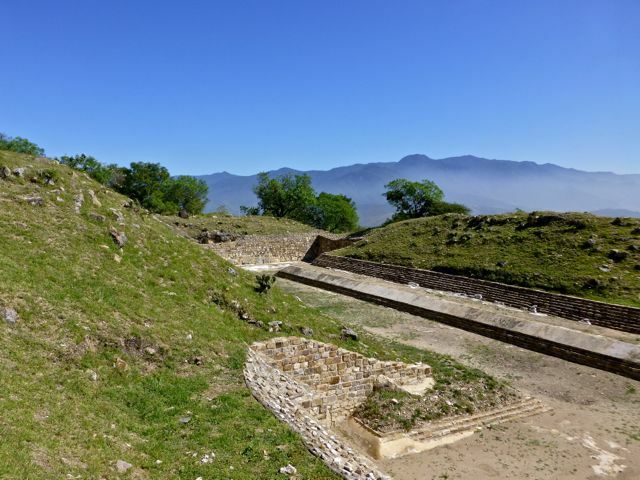 At long last, and with not much fanfare, the Atzompa archeological site is open to the public! 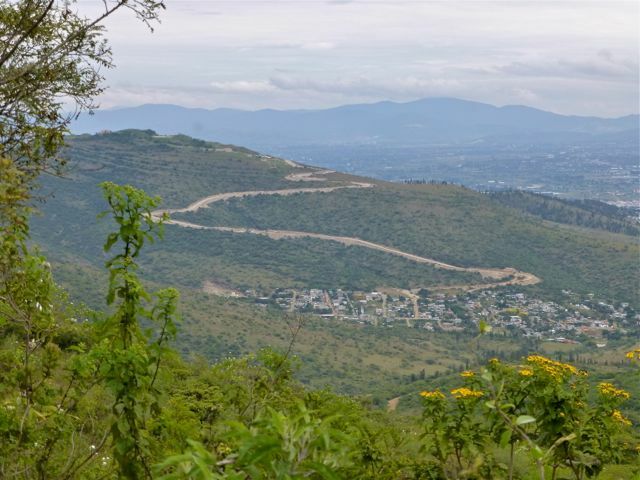 The winding road, cut into the side of the mountain, has been visible for a while and we could see platforms when we were up at Monte Alban (about 5 miles away) two weeks ago. It’s a bit of a hike up a newly paved road from the small (temporary?) parking area under the pine trees, but we eventually reached the site and the ball court. It is small, but the setting is spectacular. 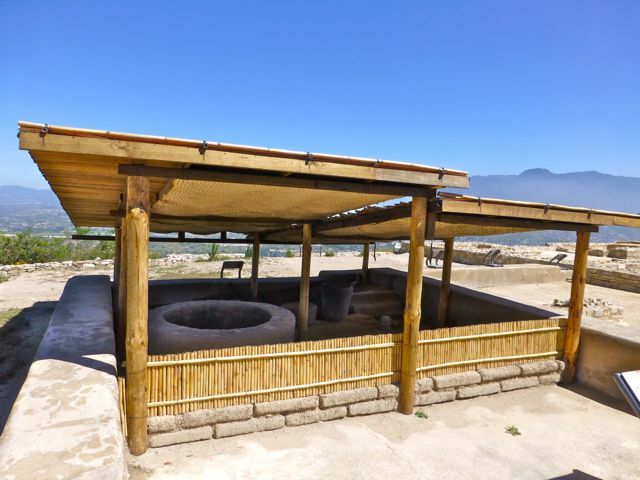 One can see a recreation of the 1,000+ year old Zapotec kiln that was uncovered 8 feet down — offering proof of continuity to today’s renown potters of Santa María Atzompa. Then there is the vegetation…. 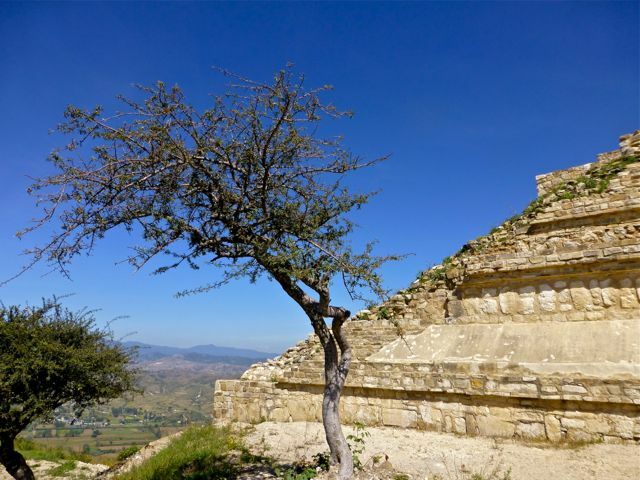 The architecture of native trees adds to aura of this ancient site. 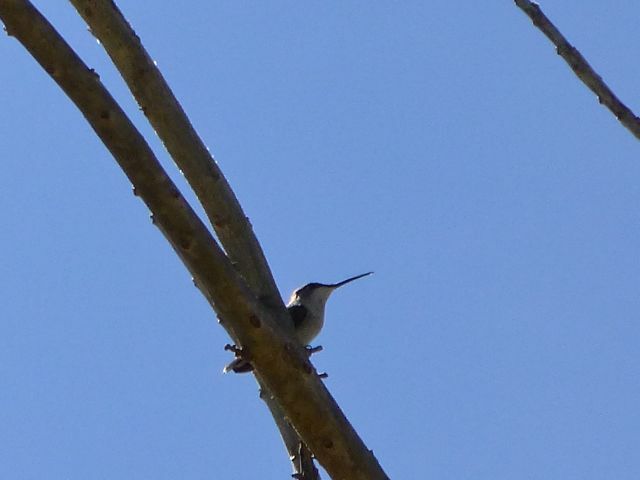 And, the white flowers of one of the trees has attracted the tiniest hummingbirds I’ve ever seen. 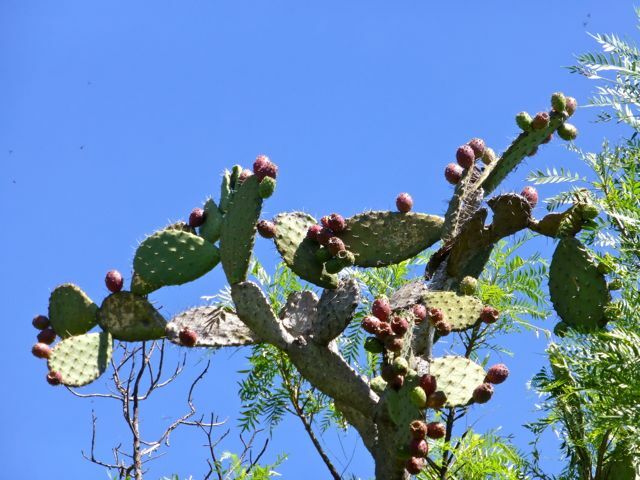 Nopal cactus, in full fruit (tunas) at this time of year, dot the landscape. 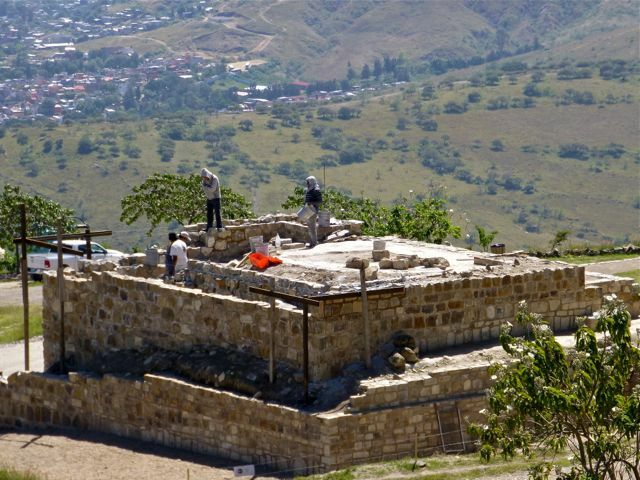 Archaeologists and their crews continue their work excavating and restoring, and much is blocked from amateur exploration, including the 1,100-year-old burial chamber. Darn! The only “facilities” available at the site, thus far, are bathrooms (which were a trip, but I won’t go into it). 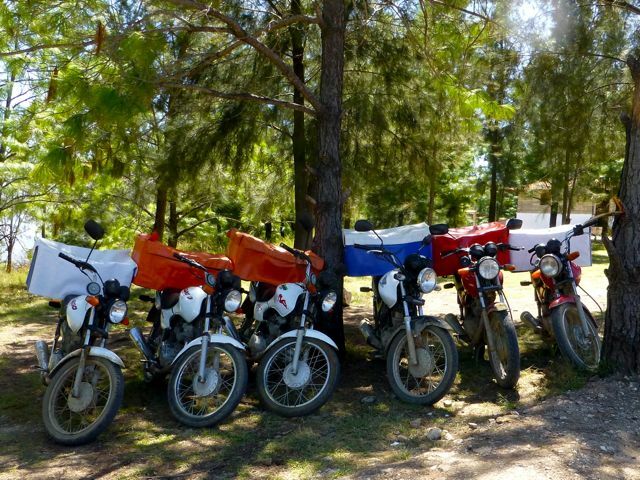 Lest you worry about comida for the workers, it arrived by motorcycle and was waiting in insulated boxes in the parking area. Aside from those working at the site, we had the place to ourselves… no tour groups and no vendors. We were left alone to listen to the birds and insects and imagine a highly developed culture, alive with the ancestors of the energetic, creative, and spiritual people we are privileged to live among. Beautiful. I am getting so excited about our trip. We will be in Mexico City Saturday afternoon. As soon as I get the bus ticket I will let you know when we will get to Oaxaca on Friday, 10/26! So excited to see you after all these years!!! 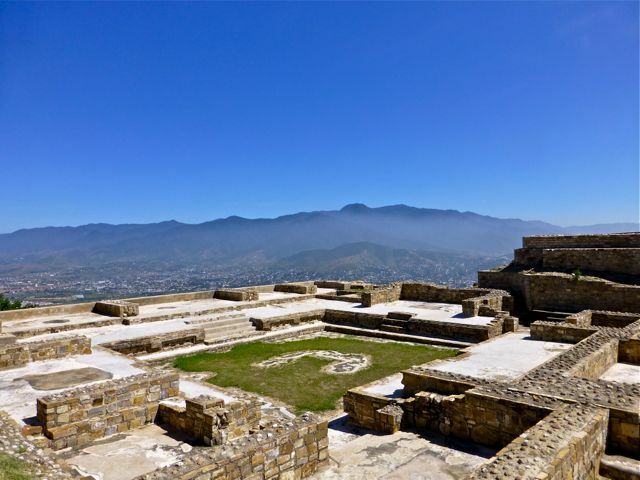 Happy to provide another excuse to return to Oaxaca! I have it on my list to do after Day of the Dead. Great shots.